Whenever I sit down to write a vintage sled article I am always faced with a huge problem: deciding what vintage sled to write about. During the late sixties and early seventies there were over a hundred snowmobile manufacturers and each manufacturer had multiple models to choose from. Ultimately what I wind up doing is picking a sled that not only has an interesting story or historical significance but also one that I have had personal experience with. This week’s article is about the 1968 Larson- a rare sled to be sure as I’m guessing most of you have never heard about it, and neither had I until one showed up in my neighbors garage when I was 15 years old. Since that day I have been wondering where that baby blue and red steel cleated tracked monster came from and the story is as odd as the snowmobile itself. When I was a kid I was lucky enough to live on the fringes of the Duluth city limits at the end of a dead end street. Our house was surrounded by woods and provided us limitless opportunities to explore the forest on a daily basis. This also made our street a prime location to own a snowmobile as you could literally walk out your back door, climb on your sled and ride for hours without having to trailer anywhere. My little brother and I were also lucky enough to have four other kids on our street that were all within a year of us in age. As mentioned in earlier articles my neighbor Paul had a stable of Ski-Doos, I had one, my brother had one and my neighbor Cy had one. The only kids that didn’t own a sled were my next door neighbors, brothers Matt and Mike but with all of Paul’s Ski-Doos we still had a sled for everybody. One Saturday afternoon we were all summoned to Mike and Matt’s house. When we arrived, Mike opened up the door of their attached garage to reveal a 1968 Larson snowmobile! Their grandfather had recently passed away and his snowmobile had been handed down to them. 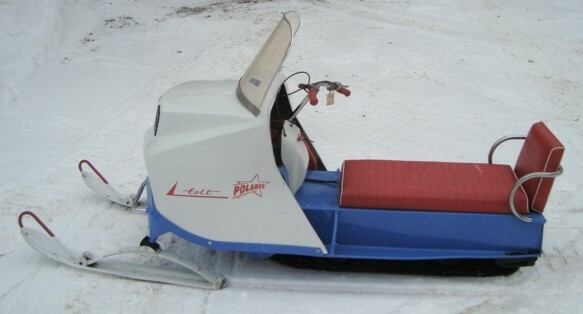 The 1968 Larson was a sight to behold- everyone on our block owned a Ski-Doo and this was an entirely different animal. The hood was basically a big square with a windshield slapped on top. The tunnel, belly pan and hood were all painted baby blue- and the seat was bright red all trimmed up in shining chrome bumpers and hand grips. The gas tank (If you could call it that) was not built into the frame like it was on the Ski-Doos, it was simply a gas can strapped to the frame of the sled in the right side foot well. The track was constructed of two strips of rubber held together by giant metal cleats with a center sprocket drive and bogey wheel suspension. 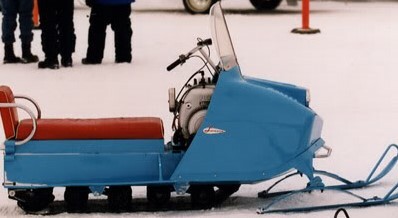 The whole thing was powered by a 297 JLO engine, which, like most of the late 60’s model sleds, was sitting right in your lap. Unfortunately the sled hadn’t been run in years so our first task was to get it back into running order. We pulled and pulled on the JLO engine (Which we immediately renamed the Jell-o engine) but we couldn’t get it to fire so we started off checking all of the things that we knew an engine needed: air, fuel, and spark (all of us were self-proclaimed small engine experts due to our constant tinkering on snowmobiles, lawn mowers and minibikes often times with pretty marginal results). The carburetor seemed okay so we removed the sparkplug and my brother tried to dump some gas in the cylinder and covered most of the engine in gasoline in the process. We put the spark plug back in and pulled again- still nothing. “Let’s check for spark,” Matt said and we pulled the plug again, hooked it up and laid it against the engine block- Mike pulled on the cord and we had spark alright- in fact the spark from the plug instantly ignited the gasoline we had spilled on the engine block and the whole front half of the sled burst into flames. To make matters worse the entire floor of Mike and Matt’s garage was covered in hay that they used for their outdoor dog kennel and that quickly caught on fire as well. In a furious panic we all ran outside and grabbed handfuls of snow to through on the rapidly spreading flames. Luckily we got everything out and then cleaned up all of the evidence before Mike and Matt’s mom came home and saw that we nearly burned down the house. We decided that the problem must be that the gas had been sitting in that gas tank forever so the next day we got fresh gas, a new fuel filter and some starting fluid and viola, the old Larson came back to life. The Larson wasn’t a pretty sled, it wasn’t sporty and it handled like a tank- but, like a tank, nothing stopped it either. The steel cleated track gave it incredible hook up on the snow but there was absolutely no give and zero slide factor so you had to really force it into the turns. We had a few trails that cut their way through stands of small saplings and on one occasion the Larson couldn’t quite make the hairpin turn- it didn’t matter because it simply ran over some of the small trees and made its own new trail, the front bumper acting more as a brush guard. Having the privilege to ride one of these rare off brand snowmobiles from the golden age of snowmobiling, I went on a quest to find out more about the Larson and was surprised to find out that the story behind the Larson snowmobile was as unique as its look. In the mid 1960’s the Larson boat company in Little Falls, MN were minority owners in Polaris Industries. Looking to capitalize on the new booming snowmobile market they began purchasing chassis from Polaris and then adding their own hood configurations to create the Larson snowmobile. For the 1968 Larson Model year, all of the Larson Chassis were simply left over 1967 Polaris models. If you look at the ’68 Larson and the ’67 Polaris everything is identical on the tunnel, from the red seat to the chrome handles to the light blue paint job, Larson simply fabricated their own hood for the ’67 Polaris frame and the ’68 Larson was born. It came in three models- the 292cc Falcon, the 297cc Hawk and the 372cc Eagle. Unfortunately for the Larson, the snowmobile industry was too competitive of a market to continue in and after 1968 the Larson Boat Company abandoned its snowmobile business and went back to concentrating solely on building boats. Luckily before that happened one of their sleds landed in my friends grandpa’s garage and ultimately on the trails around our neighborhood. This entry was posted on November 18, 2015 by John Hartley.